Allstate has run a print ad in the royal baby issue of People magazine, sharing the excitement surround the newest British heir, George Alexander Louis. 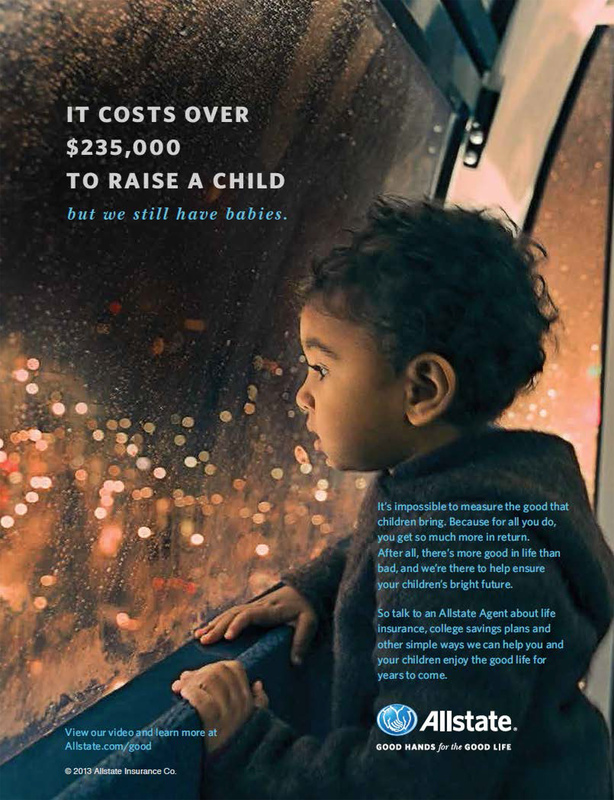 The ad reports it costs more than $235,000 to raise a child, and yet parents are not deterred. Safe to say, it’s probably costs a little more if your child is considered royalty. The print ad reminds us that Allstate is not only there when Mayhem comes, but for happy times, too. The print ad connects with the Allstate site, allstateonline.com/goodlife and their “Good Life” commercial, released in May 2013. The Babies campaign was developed at Leo Burnett Chicago by chief creative officer Susan Credle, executive creative director Charley Wickman, creative directors Mark Wegwerth and Chris Cole, art director Scott Smith, copywriter John Kistner, producer Nia McCarthy, account director Andrew Melone and account supervisor Jonathan Linton.